With their early blooms and graceful forms, flowering dogwood trees make excellent additions to Arkansas' streets and home gardens. Wild dogwoods fill the state's woodlands with clouds of fragrant white or pink blooms between March and May. Their deep red leaves provide interest throughout the summer, and their berries feed several species of birds and wildlife. Roughleaf dogwood (Cornus drummondii) grows wild in Arkansas' woods and around its swampy areas. A small tree, seldom reaching more than 16 feet tall, it has 4-inch oval-shaped leaves with hairy surfaces that account for its name. Roughleaf dogwood produces wide, flat clusters of creamy white to yellow flowers on the ends of its branches between late April and June. Butterflies feed on the flowers' nectar. Birds feed on the white berries that follow the flowers. Roughleaf dogwood's foliage provides reddish-purple autumn color for three seasons of garden interest. If unchecked, the trees' spread by root suckers to form thickets where birds nest. Plant roughleaf dogwood in a partly shady to shady location with moist, well-drained slightly alkaline soil. Trees handle any soil type from sand to clay as long as they have adequate moisture. If you don't want your roughleaf dogwood to spread, mow or dig up its root suckers. 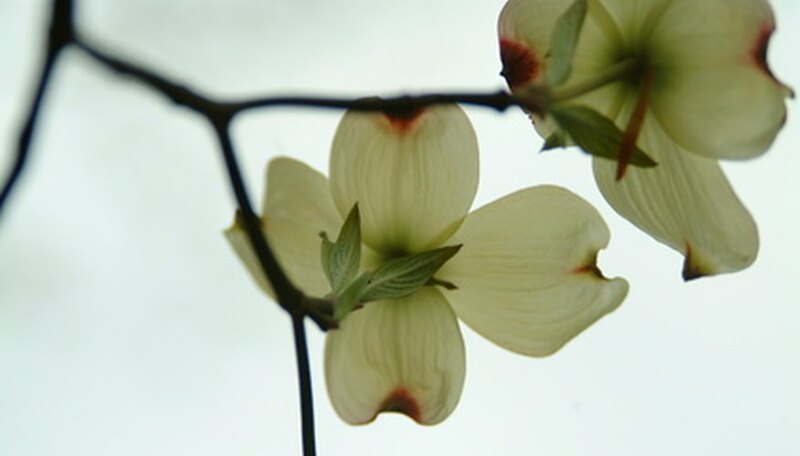 The most familiar of all dogwood varieties, flowering dogwood brings color and fragrance Arkansas' shady woods and stream banks between March and May. A small to medium tree, flowering dogwood normally grows between 20 and 40 feet with horizontal branches. Its white or pink, 3-to-4-inch spring flowers give way to red berries, and its green summer leaves to scarlet autumn ones. Flowering dogwood will bring color to your garden for most of the year. Birds, small mammals and even deer feed on its berries. Like roughleaf dogwood, flowering dogwood wants a partly shady to shady location. It prefers rich, sandy or loamy soil on the acid side. Flowering dogwood works equally well as a single specimen or in groups. Its horizontal branches make it an effective shade tree. Alternate leaf dogwood (cornus alternifolia), according to the Lady Bird Johnson Wildflower Center, is sometimes called pagoda dogwood because of its tiered horizontal branches and flat crown. About the same size as flowering dogwood, these trees have unusual green to reddish-purple bark and upturned branch ends. Alternate leaf dogwood blooms late, in May or June. Growing wild in Arkansas' woods and on rock hillsides, it has large flat clusters of creamy white, fragrant flowers followed by bluish-black berries and reddish-purple autumn leaves. Berries remain on the trees into the winter, providing food for wildlife and birds. Trees will grow in poor soil but are happiest in cool shady locations with acidic, rich, moist, well-drained soil.